Math Mammoth Grade 1, South African Version is a complete maths program for 1st grade. It consists of two student worktexts (A and B), a separate answer key for each, tests, mixed revisions, and in the download version, an additional worksheet maker (Internet access required) to make extra practice worksheets when needed. Reasoning about attributes of geometric shapes, such as the number of sides and the number of corners, and composing and decomposing geometric shapes (chapter 6). Additional topics we study in the first grade are the clock to the half hour (chapter 5) and counting coins (chapter 8). Please also see the table of contents for 1-A and 1-B (in the sample files), which will let you see the topics covered in more detail. The names used are South African names (such as Ansie and Jali). The currency used in word problems is rand. The money chapter teaches both rand and cents. The material is "all metric". In other words, the US customary measuring units are not used. Spelling is British English instead of American English. Geographic locations used emphasize South African locations (such as Pretoria, Johannesburg). Please note that the curriculum is not following the South African official syllabus for 1st grade maths. 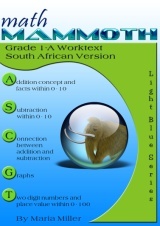 Instead, it simply is a copy of the US version of Math Mammoth Grade 1. For the most part, Math Mammoth exceeds South African standards. Some standards may not be covered. Please read more about the 100-bead abacus on the FAQ page. A non-digital clock or other analog clock where you can turn the minute hand and the hour hand will turn accordingly (for 1-B). A ruler that measures in centimetres (for 1-B).